Unashamed bluegrass sinners, The Pigs have taken it upon themselves to reinterpret a formidable collection of Australian pop songs on their new album called The Pigs’ Home Brew: 13 Aussie Classics. The Pigs have built a reputation for dismantling mega-hit songs and rebuilding them in their signature style. Now, at the peak of their interpretive powers, they turn their hillbilly tractor beams towards home. Some of the reworked songs include Powderfinger’s My Happiness which has been converted to a country waltz. In addition we hear Farnham’s You’re The Voice receive a wild yodel makeover and Olivia Newton John’s Physical performed with unnatural desperation. Further, INXS’s Devil Inside has a lot more devil inside it. The first single from the album is You Just Like Me Cos I’m Good In Bed, featuring Red Symons on pedal steel guitar and accordion. The Pigs have taken a different approach to recording this album, seeking to capture the energy of a live performance. “We didn’t want to split into different rooms and wear headphones,” says Stretch Pig “we just wanted the record to sound like people playing music in a room together. So we went to a cottage in the bush, set up some microphones and had some fun playing the songs.” Every song was captured on multi-camera video. We’re celebrating the songs that we love and the songs we grew up with, from Cold Chisel to The Avalanches – T-Bone Pig. The album also features many of The Pigs’ greatest hits, taken from a career spanning 10 years, 4 albums, 1 EP, concerts all over Australia and the world, countless TV and radio appearances, “squillions” of beautiful fans and 4 very painful blisters. 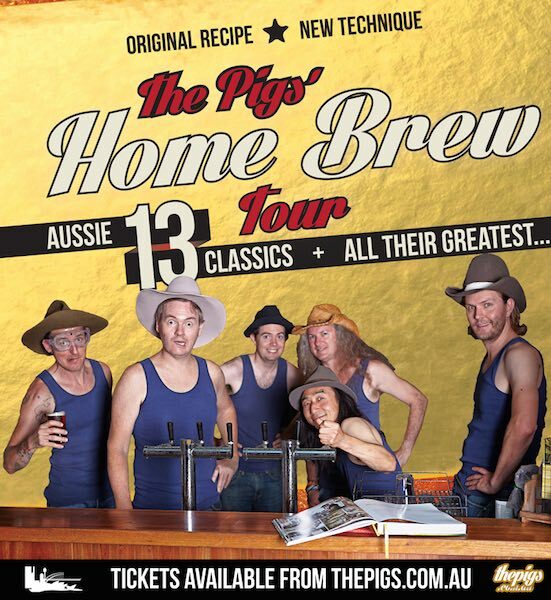 The Pigs’ Homebrew Tour is an event that’ll test your Reg Grundies and quite possibly, change your life. Some time ago the Pigs appeared on the television program Australia’s Got Talent.